This is one of TAPPI's most successful annual training courses, offered for ten years! Understand product performance and pulp quality by knowing the differences in wood and fiber variations. Provide the basics in troubleshooting, optimization and control by better understanding "why things happen" in pulping and processing - the variables affecting pulp quality. In helping you learn these outcomes and more, Course Chair, Dr. Michael Kocurek, shares his collection of more than 1,000 visuals during the Course Schedule, which you'll have for review later at the mill. Attendees will receive the visuals in a printed Notebook, and in color on a PDF flash drive. This is the most comprehensive two-day introductory to intermediate-level course on Kraft Pulping and Bleaching in the industry. These topics provide the foundations for future learning of more advanced topics at the mill, such as optimization and troubleshooting, which are mill-specific. What are your specific learning objectives and what would you like to take away? What is a specific technology related “hot topic” for your mill or company? What process related troubleshooting topic would you like to see discussed as a basic level case study? Your answers will contribute to some customization, within the scope and available time, to increase the value of the course. The TAPPI Introduction to Kraft Pulping and Bleaching course is ideal for anyone new to the kraft pulping process, particularly process engineers, machine operators, kraft pulp operators and suppliers. Having the foundation of knowledge to take on more advanced projects, including troubleshooting both process and pulp quality problems. The ability to better train new employees. Register before July 12, 2019 to save! Seats will sell out to the first 25 participants to encourage optimum student/instructor interaction. TAPPI awards 1.3 Continuing Education Credits (CEUs) for completion of this course. TAPPI's Professional Development department has been accredited as an Accredited Provider by the International Association for Continuing Education and Training (IACET). In obtaining this accreditation, TAPPI has demonstrated that it complies with the ANSI/IACET Standard which is recognized internationally as a standard of good practice. As a result of the Accredited Provider status, TAPPI is authorized to offer IACET CEUs for programs that qualify under the ANSI/IACET Standard. If you would like a comprehensive overview of papermaking and pulping, consider attending the TAPPI Introduction to Pulp and Paper Technology Course, January 6-10, 2020 in St. Petersburg, Florida. This training delivers insight into the technology of raw materials, pulp mill operations, bleaching, chemical recovery, stock preparation, paper and tissue wet end chemicals, paper machines, tissue machines, creping and coating, and also includes the HD chest in pulping to reel on the Papermachine. Review the detailed Course Schedule. "I’ll be able now to better understand customers’ issues and processes. Networking with other people within the industry was great. I liked hearing their points of view and areas in which they are interested." This course is ideal for anyone new to the kraft pulping process, particularly process engineers and operators. New this year, a summary of selected new developments will be presented, as reported in TAPPI's Pulping Conference (PEERS) Proceedings, and from additional resources. Attendees can request copies during or after the course. The small class size, breaks every hour, and lunch are designed for maximum interaction between class participants. Attendees help design the course by completing the pre-course Survey that asks “why are you coming to the course,” and what topics you would like covered. Dr. Kocurek encourages contact during or after the course to have attendee's questions answered. If he does not have the answer, he involves other experts. Note: For participants who desire additional depth and/or introductory review, Professor Kocurek will be available until 6:00 PM. Note: For participants with later departures, Professor Kocurek will be available for further Q&A and discussion. This curriculum covers various process variables, the “why things happen,” and will provide a foundation for the advanced-level topics below. This course does not cover training topics, such as equipment design, operations in depth, maintenance, process control, or mill-specific topics, such as optimization and troubleshooting. Dr. Michael Kocurek shares more than 40 years experience. Dr. Kocurek, Professor Emeritus of Paper Science & Engineering at North Carolina State University, is one of the world's most recognized educators in the pulp and paper industry. His focus is on Pulp & Paper Technology, Linerboard Manufacture, Tissue Manufacture, Paper Properties, and Workforce and Professional Development. He has taught students and thousands of industry operators and professionals at more than 200 mills and 50 paper industry corporations, government and other organizations, including TAPPI, the Department of Energy (DOE), Environmental Protection Agency (EPA), and the American and Forest Association (AF&PA). Additionally, he has taught undergraduate and graduate students since 1970. Dr. Kocurek has developed seven distance e-Learning P&P technical courses under a National Science Foundation (NSF) grant at Coastal Alabama. He is the course chair for TAPPI's oldest and highly ranked short course on Introduction to Pulp & Paper Technology (for 44 years). He is the editor of 11 books, including the recognized Pulp and Paper Manufacture series covering the entire field of pulp & paper. He has authored and/or co-authored 25 video publications, including the Introduction to Pulp & Paper series- again covering the entire field of pulp & paper. Dr. Kocurek received his B.S., M.S., and PhD degrees in Paper Science & Engineering from the SUNY College of Environmental Science & Forestry, and Syracuse University. He has served as Paper Science Department Head at the University of Wisconsin-Stevens Point, an academic program he founded; and NC State University. He also has served as Executive Director of the Herty Foundation, an authority agency of the State of Georgia. While at Herty, he oversaw a $27 million modernization of the laboratory, creating the largest pilot scale P&P and advanced fiber development center in the US. His honors include TAPPI Fellow, TAPPI Distinguished Service Award, TAPPI Paper and Board Division Technical Achievement Award; and induction into the Paper Industry International Hall of Fame - an honor bestowed to recognize people who have made preeminent contributions to the global paper industry. Register before Friday, July 12 to save! Be the early-bird. Discounts are available for those who register before Friday, July 12, 2019. Please call the hotel directly for the best rate. Take the Gold Line from the Atlanta Airport to Doraville station, which is the last stop on the gold line (about 45 minutes). A cab will cost approximately $15 and will take about 15-20 minutes to get from the Doraville Station to TAPPI. Marta cost is $3.00 each way. Rental cars are available at the Atlanta airport. Parking at the Hilton is complementary. Avis offers special discounts off regular rates for participants. To reserve your car, call 1-800-831-8000 and refer to the code AWD: #U226600. Order publications as you register to save on shipping. Build your skills and expertise with these TAPPI PRESS publications, which are discounted exclusively with your registration for this course. Select your books at the same time that you complete your online registration to take advantage of this offer. 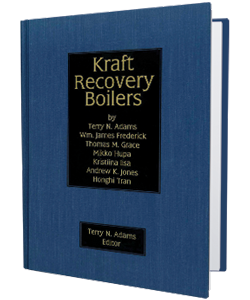 By Adams, T.N., Frederick, W.J., Grace, T.M., Hupa, M., Lisa, K., Jones, A.K., Tran, H.
This comprehensive textbook covers recovery boilers in great depth and pulls together information on combustion, safety, emissions, plugging, and corrosion. The book also covers fundamental chemical and mechanical engineering principles that bear directly on black liquor and recovery boilers. It contains information about typical values and the normal range of important variables, plus many example calculations, data tables, and charts of relevant material properties or constants and conversion factors. Written by a team of industry experts, the text includes a great deal of practical information such as simple tests to pinpoint problems, important observations to help understand issues for particular operations, and "rules-of-thumb" that are generally used in the industry. This text was written as a project of AF&PA and published by TAPPI PRESS. 1997. 380 pages, hard cover. This text covers fundamentals and processes from chemical composition of pulp to technology, production, and the environmental impact of bleaching. 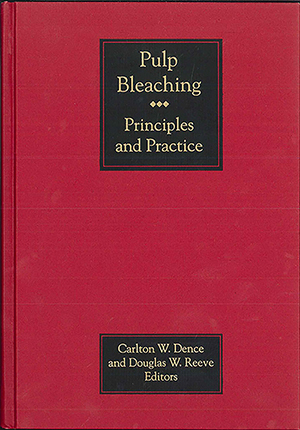 Designed as a textbook and reference book, Pulp Bleaching: Principles and Practice explains what bleaching is, why pulp is bleached, and how bleaching is done. 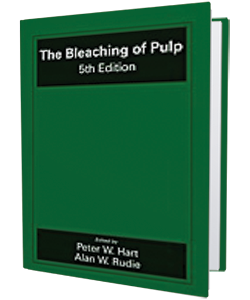 The book also features discussions on several "hot topics" in pulp bleaching, including elemental chlorine free bleaching, totally chlorine free bleaching, enzyme assisted bleaching, and bleaching of recycled fiber. In addition, the book is key word indexed and each chapter contains extensive references. 1996. 880 pages, hard cover. By Alan W. Rudie, Ph.D., and Peter W. Hart, Ph.D. This book details the chemical engineering fundamentals of the kraft recovery process, including mass and energy balances, thermodynamics, fluid dynamics, phase separations, heat and mass transport phenomena, and reaction kinetics. Each kraft recovery unit operations, including multiple effect evaporation, recovery boiler operations, green liquor processing, causticizing, and white liquor processing is discussed in detail. Sample problems are posed and detailed solutions are presented. Additional instructive process problems are included at the end of each chapter for analysis and solution by the reader. This book is ideal for senior or graduate level courses for pulp and paper, chemical, and mechanical engineers, as well as a valuable reference resource for practicing pulp mill engineers who want to better understand the kraft recovery process they operate each day. TAPPI PRESS is known around the world as an industry leader for publishing reliable, practical books, reports, conference proceedings and CD-ROM-based training products that help members, students, and other industry professionals enhance their technical knowledge in order to solve technical problems.